The Le’Veon Bell contract saga was always going to be about much more than Le’Veon Bell. Bell refused to play the 2018 season on a second franchise tag—after passing on a long-term contract offer from the Steelers that would have made him the league’s highest-paid running back, but was short on full guarantees. It was an enormous self-bet by a premiere player at a position that’s seen its value gutted by the NFL’s cost-controlled rookie-wage scale. Wherever Bell wound up—for whatever the terms—it was bound to be a fascinating case study in NFL bargaining dynamics. What Bell’s contract quest uncovers is a question: As things now stand, should elite players like Bell pursue bigger multi-year guarantees, or would they be better off trying to secure as much cash as possible on the front end of any new deal? There’s plenty of evidence to suggest Bell and other stars—as opposed to marginal and even above-above average players, who represent a substantial majority of the NFL—might be better off forgoing guarantees in lieu of early cash flow, as counterintuitive as that may seem in a league where so much of the contractual risk tends to fall on the players. It’s the great paradox of the entire system: Elite players have the leverage to secure bigger full guarantees, but getting bigger full guarantees requires taking shorter, cheaper deals—and depending on the circumstance, that may not always be wise. A quick review: Bell signed with the Jets for less than the Steelers reportedly offered him, in aggregate. The Steelers were willing to give maxes of five years and $70 million, with reports suggesting the full guarantees ranged anywhere from $10 million to $20.5 million. Officially, Bell’s Jets deal is for a max of four years, $52.5 million, with incentives and escalators that can push it as high as $60.15 million. The full guarantee is $27 million, with $35 million in injury guarantees. Mind you, that’s after Bell gave up the $14.5 million he would have earned last year had he played on the tag. Yes, by taking a stand Bell forced his way into free agency—an opportunity that had been denied to him for six years, in a league where the average career spans fewer than three seasons and the position he plays is unforgivingly punishing. Yes, Bell kept himself from being run into the ground by the Steelers for another year, just as he was about to turn 27. Yes, he secured more full guarantees than any non-rookie running back. But Bell also left a lot of money on the table—money he was very, very, very likely to earn had he taken the Steelers’ offer, and money that ironically went straight back into the Steelers’ pockets. What’s obvious is that Bell misread his market. He excels as a rusher, a pass catcher, and a pass-blocker, and he wanted to be paid as a positionless player—a common structure in the NBA but a threshold that’s never been crossed in the NFL. It just didn’t happen. 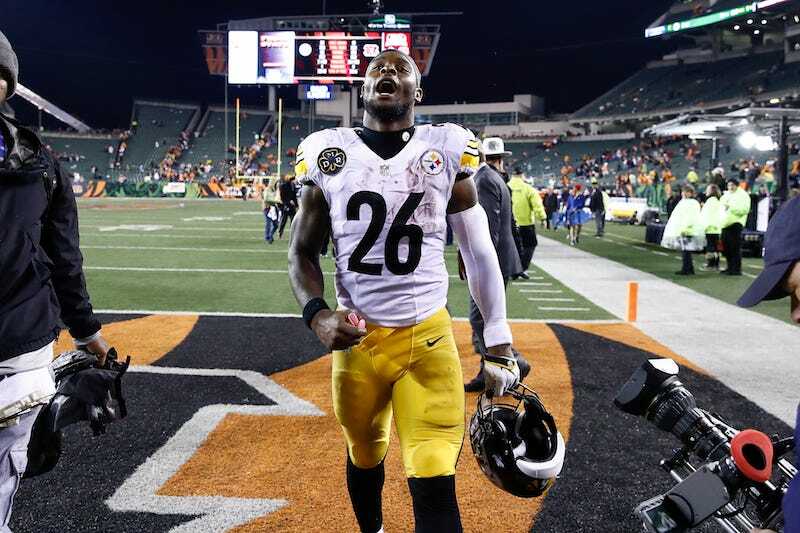 The Steelers’ offer, according to Sports Illustrated’s Albert Breer, would have paid Bell $19.5 million in Year 1, and a total of $33 million through Year 2, which is where he would have been in 2019 had he taken it. Instead, he’ll earn $14 million in cash this year—or $19 million less in total through 2019, since he collected nothing last year by sitting out—and a total of $27 million through 2020. Bell essentially paid $19 million to gain an additional $7 million in full guarantees. Yes, that offer from Pittsburgh reportedly only included $10 million in full guarantees the first year, with an additional report from Pro Football Talk’s Mike Florio suggesting another $10 million in full guarantees was on the table via roster bonuses. But according to Jason Fitzgerald, the founder of Overthecap.com and the co-author of Crunching Numbers, a book about NFL contracts and the salary cap, Bell’s $19.5 million in Year 1 was effectively guaranteed. The tendency of star players (“top tier” players, as Banner put it) to get paid for at least two years on a multi-year deal. Ian Whetstone, who analyzes the Steelers’ contracts and cap for SteelCityInsider.net, ran the numbers for me. According to Whetstone’s research, the Steelers have done 30 significant second contracts for homegrown players since 2002, including three players still active on their second deals. Whetstone defined “homegrown” as a player the Steelers either drafted or first acquired as an undrafted free agent. He defined “significant” as a deal with an average per year (APY) of at least 1.5 percent of the salary cap in the year of signing. Which means Bell was almost certain to see $33 million from the Steelers over two years, as opposed to the $27 million in two-year cash flow he’ll now see from the Jets. Precedent even suggests Bell was still highly likely to collect his Year 2 money even if he had been injured during Year 1: That’s exactly what happened to Steelers cornerback Cortez Allen, whose 2014 season—his first on his new deal—was cut short by injuries. Allen’s eventual release only happened after Year 2. Of course, 30 players across 17 years is an extremely small sample. But it does represent a grouping of core players, and Banner’s tweet was careful to distinguish “top tier” players as those who tend to get paid more of what they’re contractually owed. Whetstone hasn’t run the numbers for every team—such an undertaking might take years, he said—but in his estimation, the Bengals and Packers have similar track records of paying most of what’s contracted to players they develop, and that they along with the Steelers would rank 1-2-3 in the NFL in this regard, in some particular order. “But I’d think that nearly all teams pay out a greater portion of their homegrown contracts than their outside free agent contracts; in that regard, I wouldn’t call it unique,” Whetstone told me via email. All three teams tend to front-load their deals in lieu of guarantees, which allows players to collect a substantial portion of the total even if the team pulls the plug before the deal expires. This front-loaded cash thus effectively functions as a guarantee. Whetstone went on to suggest that there also may be something of a self-fulfilling prophecy at work here: Agents know teams like the Steelers, Packers, and Bengals tend to pay more of what’s contracted, so those are the type of deals agents tend to negotiate for. Also, it should be noted that the NFL’s archaic “fully funded rule,” which mandates that any fully guaranteed money be placed into escrow at the time of signing, has long provided some teams with an excuse against committing to guarantees. The rule dates to a time when some league owners had genuine cash flow problems. But that’s, uh, not so much of an issue in today’s $14 billion NFL. Every year as free agency comes and goes, deep dives into NFL contracts often focus on reported (max) numbers vs. guarantees, with a more recent emphasis on full (i.e., true) guarantees. But very little attention is paid to the sort of deals teams give their own players before they hit free agency. A recent analysis of free-agent contracts signed between 2011 and 2016 by Danny Heifetz of The Ringer showed that five-year contracts were more likely to end after one year (14.7 percent) than the full five (13.7 percent). And of the 648 multi-year deals Heifetz studied, the highest percentage (36.9) lasted two years. But most of these players were not stars: Of the more than 80 players to get cut one year into a deal of three or more years, just 11 collected more than $10 million, and only one had an APY that exceeded $10 million. Also, seven teams—Steelers, Bengals, and Packers, along with the Giants, Panthers, 49ers, and Rams—did not cut a single player one year into a multi-year deal. And Heifetz’s research did not include contract extensions or players who had re-signed with a team without hitting free agency. It would be fascinating to see the data on what every other team pays its homegrown players on second contracts. But even without it, Fitzgerald couldn’t think of a recent example of a player anywhere in the NFL who was cut one year into any kind of megadeal, either because of injury or poor performance. Fitzgerald said Bell would have instead been better off sitting out in 2017, the first time the Steelers tagged him. There was less money ($12.1 million) to pass on, for one thing. But it also would have put more pressure on the Steelers. The tag doesn’t prevent other teams from making contract offers to tagged players, but by setting the compensation at two first-round picks, it effectively makes the cost too prohibitive. But if a player sits on the tag, Fitzgerald explained, the compensation the following year if the player is tagged again falls to a first- and a third-round pick. That might have generated some interest last offseason, which could have forced the Steelers’ hand in some way. But maybe Bell had motivations that went beyond the purely financial. In a recent interview with SI’s Jenny Vrentas, Bell took direct shots at the Steelers and at quarterback Ben Roethlisberger. It’s hard to know how much of his decision to sit last year was about money and how much was about a desire not to play for the Steelers. At the end of the day, I wanted to go where it would make me happy and have the guaranteed money, no matter what happens to me. I’ve seen what happened to Ryan Shazier, and I’ve seen that with my own eyes. I have to protect myself. The owners are protecting themselves, I have to do the same thing. Any other team and it would have been entirely fine. But the way [the Steelers] structure it and the way I am, I simply can’t rock with it. Which would explain why a star like Bell at least wanted the opportunity to taste free agency, no matter what the Steelers were offering him. The rookie pay scale, which incentivizes teams to pursue younger, cheaper players—particularly at running back, where there is a surplus of younger, cheaper talent—worked in concert with the franchise tag to keep that from happening. I shared Banner’s tweet with an agent who has negotiated a second contract for a prominent running back and asked whether it was better for players to seek more front-loaded money in lieu of guarantees. Is Kirk Cousins&apos;s Fully Guaranteed Contract A Sign Of Things To Come?